Hello friends! I can’t tell you how happy I am that I finally have the time to sit down and write this post. Because I really do love the writing aspect of this blog–it makes me reflect on the ways in which I’ve been spending my time, almost like a journal–but it’s been difficult for me to set aside the time to write these past few weeks. The days have been long and the weeks so, so short this fall and winter–college stuff etc. etc. has been eating up my spare moments and time feels like it’s been slipping away. But these weeks have also been filled with so many wonderful things: dinners with friends, boggle and card games during free periods, and Star Wars–lots and lots of Star Wars. On January 1st, after I hit send on my last (!!!) college app ever, my family and I left for Paris. Not to state the obvious, but Paris is incredible–while it rained for much of our stay, the gloomy, overcast skies almost seemed to make the city more magical. Highlights were an amazing chocolates and pastries tour (the history of chocolate in France is so interesting! ), a market cooking class, a nighttime tour of the Louvre, and lots of walking, eating, and enjoying. The culture around food and the pride each chef and baker takes in their work is so inspiring to me–I feel so lucky to have had the chance to immerse myself in that world for a week. Now, with college apps sent out and the rest of my senior year of high school ahead of me, I am so excited to spend the next few months devoting my time to the things I love most–to family time, to friends, to art, to exploring the city, to the classes I love, and to this blog. If writing essays about this site has taught me one thing, it’s that the space I’ve created here is a special one; I can’t wait to see where it takes me. When I first started writing here in 2013, my recipes usually came word-for-word from the cookbooks and few blogs that I read regularly. And while that approach helped me to grow comfortable both with baking and with writing, I’ve found that, as I’ve grown older, I’ve started looking to my favorite blogs and cookbooks less as ideals that I should strive to duplicate, and more as inspirations that I can use to feed my creativity. Now, I find myself drawing from a million sources and ideas and photos in order to put together one recipe and post. I’ve fallen in love with that aspect of food media–that is, with the idea each piece that I write represents a balance between all of the sources that inspire me and my own thoughts, ideas and stories. I see a lot more of myself in my work nowadays, and I love how this website acts as a concrete documentation of my path up to this point. This recipe is a fitting representation of my growth over the past few years, in a way. It is not a reprinting of some other blogger’s recipe, but rather a combination of others’ ideas and recipes and my own. 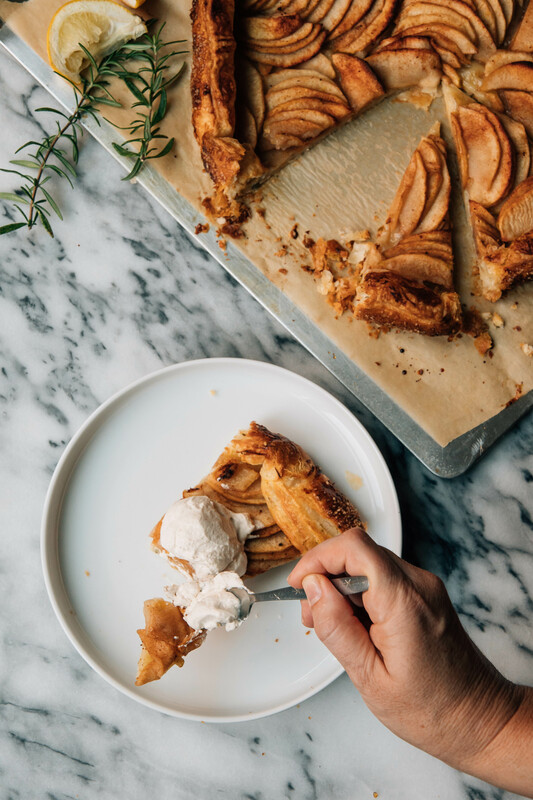 Yossy Arefi will forever be my number one inspiration when it comes to galettes–I used her spelt pastry recipe for that Pear and Cranberry number I made a year ago. 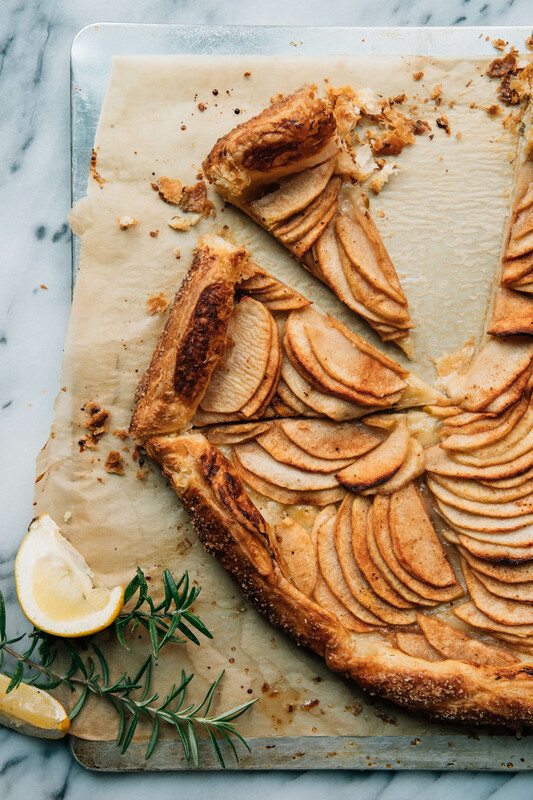 This galette is similar, but I’ve switched out the fruit for apples and went with a plain quick puff from Ashley Rodriguez via Food52. I’ve always loved rosemary in pastry, so I’ve added a couple sprigs’ worth to the crust here. And then I went and topped the whole thing with a cinnamon whipped cream because… well, why not? Music-wise: Cage the Elephant, Vampire Weekend and Arctic Monkeys. I feel like I’m a bit late to hop on those bandwagons, but I’ve been listening to more and more indie/alternative rock. Fashion-wise: Wide leg pants!! I wear them so often that now when I wear skinny jeans I swear something feels off. Food and drink-wise: I’ve been drinking all the Califia Farms Peppermint Mocha Cold Brew Coffee while it’s still in season, and recently I’ve been roasting big batches of vegetables over the weekend to bring into school with brown rice and tahini sauce for lunch. Pour in the cold water and mix for another 15 seconds, or until you have a sprawling mass of not-quite-dough. It WILL be crumbly, but don’t worry. Shape the “dough” into a rough rectangle. Complete a “letter” fold by first folding the right third of dough over the center, then folding the left third of dough over that. The dough may fall apart during these first folds, but just press it back together. Turn the dough 90 degrees. That was your first “turn.” Complete two more turns following those same steps (the folding and turning 90 degrees). If the dough becomes too soft or the butter begins to melt, place the dough in the refrigerator for 30 minutes to firm up. After completing those first three turns, wrap the dough in plastic wrap and chill it for 30-60 minutes. Take the dough out of the fridge and complete three more turns. At this point, it should start to come together and you may be able to use a rolling pin rather than your hands. After completing the last three turns, refrigerate the dough for at least 30 minutes or until you’re ready to roll it out. Peel and core the apples, then slice them in half top to bottom. Using a mandolin or a sharp knife, cut thin slices–somewhere between 1/4 and 1/8 of an inch thick. In a large bowl, combine the apple slices, lemon juice, cinnamon, cloves and nutmeg. Set aside. Lightly flour a surface. Take the pastry out of the fridge and use a rolling pin to roll it out to a circle that is somewhere between 1/4″ and 1/8″ in thickness (it should be about 14″ in diameter). Sprinkle the pastry with 2 tablespoons of sugar and 1 tablespoon of flour. 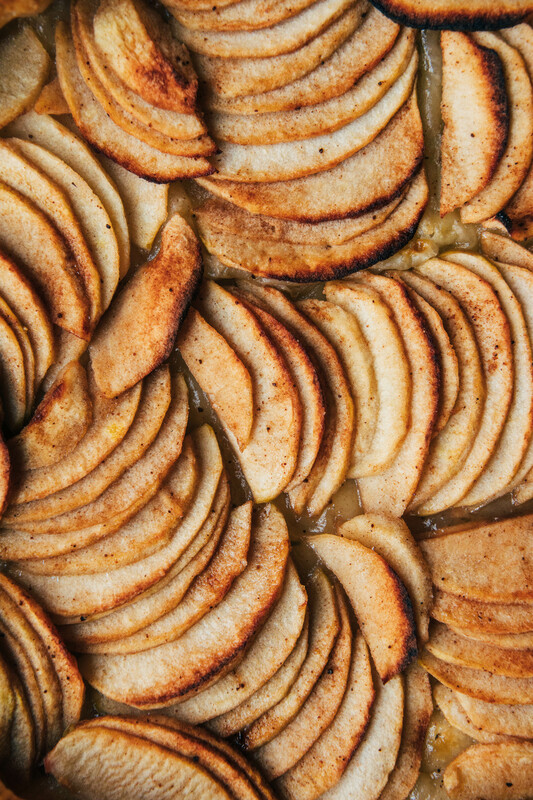 Arrange the apple slices on top, leaving a 1.5″ border of dough. Sprinkle with the remaining granulated sugar, then fold over the edges of the pastry, pressing gently to seal. Chill for 15 minutes and heat the oven to 425 F.
Brush the galette with egg wash and sprinkle generously with coarse sugar. Bake for 30-40 minutes, or until deep golden and bubbly. Let cool on a wire rack while you make the whipped cream. In the bowl of a stand mixer fitted with the whisk attachment (for the best whipped cream, chill the bowl and whisk before using), whip the cream, sugar and cinnamon until you reach stiff peaks (be careful not to overwhip, or you’ll wind up with butter!) Taste and add more sugar and/or cinnamon if needed. Slice the galette, top with whipped cream and enjoy! I never would have thought about putting rosemary in the crust! I’ve had rosemary mixed in with apples but this is a wondeful new idea. Can’t wait to try it. Oohhh cinnamon whipped cream??!!! Yum! So many of my favorite things in this recipe. And I love the photography.